• Buy fresh rather than old produce. • Once purchased, refrigerate fruits and vegetables to keep them fresh. • All produce that is purchased pre-cut or peeled should be refrigerated to maintain both quality and safety. • Do not let fruits and vegetables come into contact with raw meat, poultry, eggs, or the juices of these foods that might be present on a kitchen countertop or the refrigerator. • Drink only pasteurized milk. • Wash and dry fruits and vegetables thoroughly before you eat it to remove germs. • Realize that washing or cooking produce that is already contaminated with salmonella might not eliminate the bacteria. 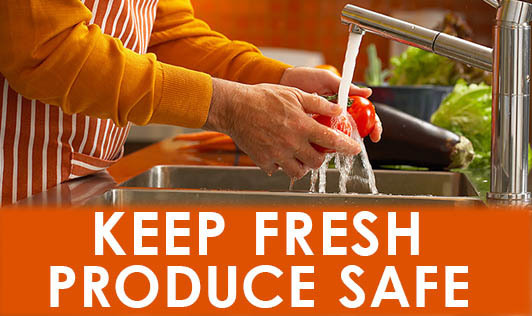 If you have produce that you suspect is contaminated, throw it away. U.S. Food and Drug Administration. 2008.